Rivers State Governor, Nyesom Ezenwo Wike has expressed shock at the plot to reverse the gains made by the state in the promotion of security of lives and property through the reposting of compromised police officers back to the state. The governor stated that he has officially informed the new Inspector-General of Police of the several postings of officers used by politicians to compromise Rivers State Security back to the state to carry out illegal duties. Addressing medical practitioners at the Government House, Port Harcourt on Monday, Governor Wike stated that should the Inspector-General of Police fail to act, he will be compelled to make a state broadcast naming the said officers and the ignominious roles they played in compromising the security of the state. He particularly pointed out that a senior police officer indicted for aiding kidnappers and cultists in the state has been posted back in the current attempt to manipulate the security architecture of the state. The governor said the officer in question was posted out of Rivers State in March 2016 after the ugly roles he played during the last rerun elections. According to him: “They are posting back security agents who have access to kidnappers. They are sending back security agents who will compromise the security of Rivers State “. He regretted that there is plot to politicise the security of lives and property in the state so as to make political gains at the expense of the peace loving peace of the state. He noted that security agencies must learnt a lesson from what happened in Turkey where the people stop up to defend their mandate. 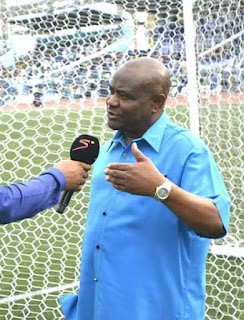 Governor Wike stated that Rivers people will always make the necessary sacrifices to ward of compromised security agents posted to the state to compromise the security network and steal their mandate. He said that those sent to the state by the political interest groups to rig the forthcoming elections will receive the treatment reserved for armed robbers.